The Munich derby. 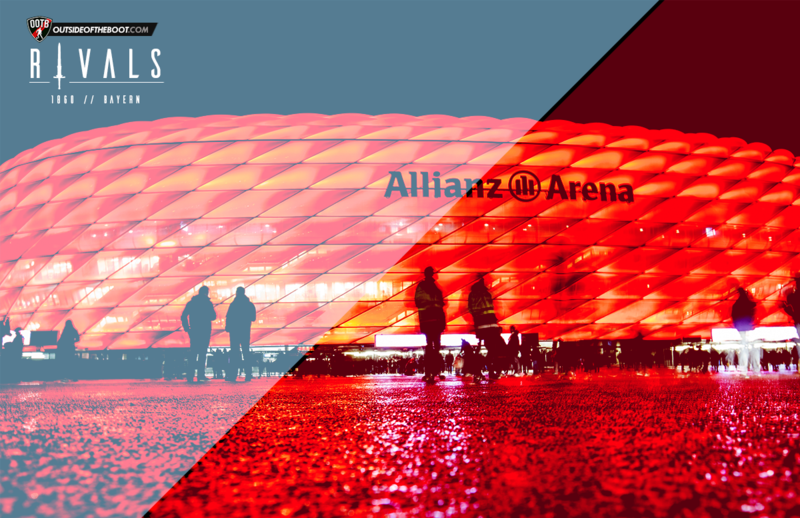 The fiercely fought football match from the Bavarian capital of Germany has a place in the heart for all football enthusiasts from Munich simply because it is the one game that is played between the two most successful clubs of the city. Against popular belief, there is a huge mass of fans for 1860 in Munich, as much as you would expect for its more successful counterpart, Bayern. From the above statement, one would hope to not make a grave mistake if they thought this was historically the most important rivalry in Bavaria, but 1. FC Nurnberg, a club whose fans consider themselves as a non-Bavarian club have the upper hand over cross-city rivals of Bayern, when it comes to Bavarian derbies. 1860 may not be playing the best of football in recent times. The last decade has seen them being nothing close to a competitor for Bayern, languishing in relegation battles to stay in the Bundesliga, while suffering the more recent years fighting the survival in 2. Bundesliga, one wonders how such a club could have ever been a competitor for the illustrious compatriot, Bayern Munich. 1860 has a past of glory too. Maybe not to the levels that would ever gain them a tag of European Power house or a tag that would put them in the same bracket as of Bayern or Hamburg. However, they would be there in the top flight of Germany as one of the clubs to watch out for. They would play the Munich derby like it was the game that would decide the title. Indeed there was a time in history when 1860 shared the better and bigger half of the spoils. Unbelievably, none other than 1860 holds the biggest margin of victory in the Munich derby. They beat Bayern 8:0 on a cold winter evening in December, 1916. The game having been just 3 days away from Christmas, surely resulted in a sour Christmas for one half of the city while the other rejoiced. Nevertheless, such is football that it was not the case. Pre-world war Germany saw much more active football clubs in the Bavarian region. Bayern and 1860 were big no doubt. Nevertheless, obviously, multiple other clubs hailed in Munich. They of course competed regularly on the same levels as of Bayern and 1860. It was just another Munich derby to people in the city and the echo of the big annihilation died down in the pubs and streets by the cusp of dawn. Pre-Nazi era in Germany had football organised on a local level. The first Munich derby was contested in the year 1902. The clubs slowly gained popularity, with Bayern taking majority of the spoils through this period. As we approached the Nazi era, both clubs started to make a name for themselves on a national scale. In 1931, 1860 lost the finals of the German football championships to Hertha Berlin, while Bayern won it the following year, beating Eintracht Frankfurt. 1860 saw some good fortune during these times, establishing themselves as one of the most reputed clubs in the country and secured a 40,000 seater stadium – A BIG move considering the time period. Unfortunately, there was never a proper structure to German domestic football until 1963, when the Bundesliga officially kicked off. This unfortunately meant for 1860 that most of their accolades were on a regional level in cup competitions. As we progress through the Nazi era, Bayern Munich bore the brunt of Nazi ideologies. Most key players of Bayern’s first team were Jewish. This period saw the foundation of the Gualiga Bayern. Though Bayern suffered, 1860 saw an increase in fortune relatively. They won their first ever national trophy, the Tschammerpokal (The German Cup) in 1942, beating Schalke 04 in the finals. Everything seemed to be falling in place for 1860 to become one of the biggest German football institutions. With the fall of the nazi regime, there was a need to reform the football structure. Welcome to Oberliga! The American allied administration in Germany allowed the formation of the Oberliga Sud. The relationship between the fans of the two clubs were still at a balance until the new Bundesliga, inaugurated in 1963, disbanding the Oberliga Sud along with the other Oberligas around Germany. The rules of the league were arguably vague and harsh towards Bayern that they started out in the second tier of the division instead of 1860. The reason for this was that the German FA did not want two teams from the same city playing in the premier competition. Although Bayern finished 3rd in the Oberliga Sud, 1860 was allowed admission to the Bundesliga’s inaugural season since they placed higher than that of Bayern. This obviously sparked the hatred between the two sets of fans. This was when 1860 capitalised on the advantage and clinched the German Cup and had a successful European campaign, reaching the finals of the European Cup Winner’s cup but missing out to a well-known London club, West Ham United. 1860 did not have an easy road to the final, defeating Porto, Legia Warsaw and bettering Torino in the replay after the hard fought 2-legged tie. But West Ham were a class apart in the finals as they comfortably outclassed the German side 2:0 in the finals. What were Bayern upto when 1860 were off on their ambitious adventures? The club did not take the relegation lightly either. Bayern won the newly formed Regionalliga at the second time of asking and gained promotion to the Bundesliga the next season and it was always only one direction from there on. With both the Munich clubs playing captivating football, they were more than a force to reckon with and Munich was rapidly progressing as the capital of football in Germany, attracting the crème de la crème of German footballers to the city. In 1965, 1860 won their first ever Bundesliga title much to the disappointment of their cross-city rivals, who had a commendable campaign themselves, winning the German Cup. With how history had played so far, it seems like everything was in place for 1860 become one of the German Giants in football and Europe. But destiny as we know it, had cruel intentions for 1860. Bayern’s fortune began to change for the better, defending the German cup successfully, while also winning the European Cup Winner’s cup against Nurnberg, with the performances of 1860 slowly dipping as they missed the Bundesliga title and finished second in the league. Fast forward to 1969, 1860 finished a mediocre campaign in 10th position while Bayern were enjoying their rise to supremacy, winning their first ever-German Domestic Double. The turn of the decade saw 1860 slip even further. 1970 – 4 years before Germany won its second World Cup finals, 1860 would have hoped to contribute significantly to the national side, but unfortunately, they were relegated from the Bundesliga, which left their fans red faced in front of their rivals, Bayern, who were amassing fame and attracting the best German talent like a prized antique collector. With 1860 out of the Bundesliga picture, Bayern really started to revel in all the space, pressure and attention of being the only Munich club. The club took the decision to move to the much larger Olympiastadion, the club backed it up with commanding campaigns, winning three domestic league titles on the trot (1972-74) and started to make a name for themselves in Europe. The most successful period in Bayern’s history arose when they won three European titles (1974-76). The Bayern fans were quick to rub it all in the faces of the 1860 supporters, establishing clear supremacy showing them whose shadow cast longer as 1860 developed the tag of being a “yoyo” club. In the mid 1980s, 1860 were banished to the 3rd tier of German football due to financial circumstances. With subpar performances and no stability in staying in the Bundesliga, the club could not attract large crowds to their games, which directly took a toll on the books of the club leading to not meet the wage demands of stalwarts such as Rudi Voller. A reputation came in to the spotlight about 1860, that they were a club being badly managed that failed to pay wages to their players. The DFB did not take this lightly and banished the club to the Bayernliga in the 1982-83 season. To add salt to their wounds, big players such as Rudi Voller left the club and 1860 were made to sweat it out with poor personnel in the amateur league. The humiliation did not end there as the club lost their vehement battle of appealing the exile, coupled with the lack of quality players, 1860 finished behind the amateur side of Bayern Munich at the end of the season. It took 1860 almost 25 years to win a derby game, including friendlies between the year 1977 and the turn of the millennium. Such was the manner of the supremacy that Bayern sought to establish in 1963 and it is almost 55 years since then, it would be safe to say that Bayern have more than surpassed their goal. In fact, Bayern have gone multiple steps ahead by cheekily taking the ground sharing deal of the Allianz Arena with 1860, to becoming the sole owners of the stadium, with 1860 now having a lease arrangement with their rivals to play games at the Allianz Arena, facing the possibility of dropping to the third tier of German domestic football. A local derby is always interesting and going to attract fierce crowds. But the occasion for this derby made it even more special, being the first ever Munich derby in the newly formed Bundesliga, with Bayern contesting for the first ever time in the league while 1860 had just returned from disappointment at Wembley in the previous season. Both clubs were looking to show who was boss and a win in the first ever Munich derby in the new Bundesliga would make it even sweeter. 1860 had just signed one of Germany’s most lethal goal scorers in Freidhelm Konietzka. Previously represented Borussia Dortmund in the Oberliga West and Bundesliga, he was part of Dortmund’s fiery strike force. Making the move down south to Munich, Konietzka made an instant impact, scoring the winning goal of the derby in the first ever minute in a 1860 shirt. Sealing the 2 points were quite significant for 1860 (the old system had 2 points for winning a game), as when it came down to the final day of the season, had Bayern won this game, they would have clinched the Bundesliga title from no one other than their cross city rivals, 1860 Munchen. Almost a decade since the last Munich derby. There does not seem to be any indication that the near future would provide us with a Munich derby either. But this game had it all. Starting from heated arguments to captivating football. In fact, the game was decided by a controversial penalty in extra time. Not the most convincing win for Bayern who were sailing in the domestic league and had commendable players in the team in comparison to 1860, there was definitely a gulf in quality. 1860 started the game with much more intent than Bayern but the reds came roaring back in to the game ending with a chance created ratio of 10:2. Toni Kroos, Ribery, Klose, Podolski and Kahn proved to be decisive for Bayern. Though 1860 had only 2 chances, both required Oli to make massive saves to keep Bayern in the game. It looked like the game was heading to penalties, when Bennjamin Schwarz clattered in to Franck Ribery, who made the most of the opportunity, theatrically winning the penalty that decided the game. The 204th local derby will always be remembered as the game in which 1860 felt robbed of their fortunes, maybe they could have won and gone on to turning their fortunes, but such is football. Rudi Voller – 1860 Munchen: The German striker’s first taste of Bundesliga football came at the colours of 1860 Munchen. Unfortunately for him, in his debut season, 1860 were relegated to the 2.Bundesliga. The lethal goal scorer that Voller is, he amassed 70 appearances for the club over 2 seasons, scoring 46 goals in total. The game in which Voller made his first impact was in his debut season against Fortuna Dusseldorf. 1860 were trailing 3:0 but came back to win the game 4:3 with Voller bagging a hat trick. The first of many. Although 1860 provided young Rudi Voller with the perfect platform to launch his career, the player has a slight regret about joining the club as they were the only club he represented that were relegated, but Voller has no qualms about it, citing the tough times the club was going through. Voller decided to stick to his contract with 1860 in the 2.Bundesliga and avoided interest from Bundesliga clubs, reaping the reward of playing as a classic striker scoring 37 goals in his final season at the club. Gerd Muller – FC Bayern Munich: The man needs no introduction. Every football fan around the world knows about the immense contribution Gerd Muller has made to German football as a player. In the early years of Bayern’s dominance in the Bundesliga, Gerd Muller was the reason behind the club’s success. He had rapidly become the face of the club and one of the world’s most prolific strikers. Nicknamed as Der Bomber – The Bomber, Muller won the European Footballer of the year in 1970 and held the record for most goals scored in a calendar year, 85 goals in 1972 until none other than Leo Messi surpassed the record 40 years down the line. He was also Germany’s all time leading goal scorer until Miroslav Klose surpassed the tally in 2014 before announcing his retirement from international football. Muller has made sure he will be remembered fondly by both sets of fans thanks to the winner against Netherlands in the 1974 World Cup final that won the game for Germany. Of course there are so many more players that Bayern and 1860 have produced, who have gone on to be big players for Germany. Philipp Lahm, Bastian Schweinsteiger, Oliver Kahn, Thomas Muller, Toni Kroos, the Bender Brothers, Christoph Kramer and Julian Weigl are just a few names from the top of my head that come to mind when we speak about top players produced by the Munich clubs.